Venice Envisioned  Community looks at Lincoln Blvd. Venice Neighborhood Council - Who's Out, Who's In? 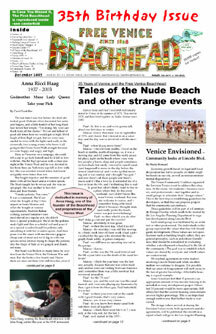 Missing Beachheads - The Collective is looking for issues 72, 88, 89, 107, 142, 144, 178, 188, 189, 222. Photo: Manuella Theiss, Milton Bratton, and Shanna Baldwin...Milton owned the bookstore next to the Venice West Cafe. Courtesy of Shanna Baldwin. HAPPY BIRTHDAY TO THE BEACHHEAD! The following readers have given the Beachhead a gift as well as their congratulations. MANY THANKS and CHEE WAH WAH! Diversity Fest - Dec. 7, 7 PM - Venice Center for Peace & Justice with the Arts, 2210 Lincoln Blvd.